Do exports really contribute to cattle prices? Here’s why trade wars with America’s best overseas customers are a bad idea. There has been lots of talk about international trade in recent weeks stemming from the hubbub surrounding steel and aluminum tariffs. All that is important discussion – especially for the beef industry. Why? Because beef imports are an easy target for retaliation. That said, it’s important to take a fresh look at the importance of the export market to the beef industry. Beef exports are a significant component of beef demand and serve to generate substantial revenue for beef producers. Accordingly, this week’s illustration highlights the influence of exports on the beef market. Last year’s beef export value totaled $7.12 billion—a new record surpassing the previous record of $6.98 billion established in 2014. That value spread across every fed steer and heifer is equivalent to about $325 per head. Expressed across the 2017 average slaughter weight, that works out to $24 per cwt. In other words, the absence of exports would back the market up by $24 per cwt, and perhaps even more given the large shift in the supply curve if the market was burdened to clear all of that product domestically. It’s clear that export markets are critical to the market. With that in mind, the politics of late can work to make markets nervous. How do you perceive the importance of international beef demand for the U.S. beef industry? From your perspective, what is the largest threat to continued growth of export markets? 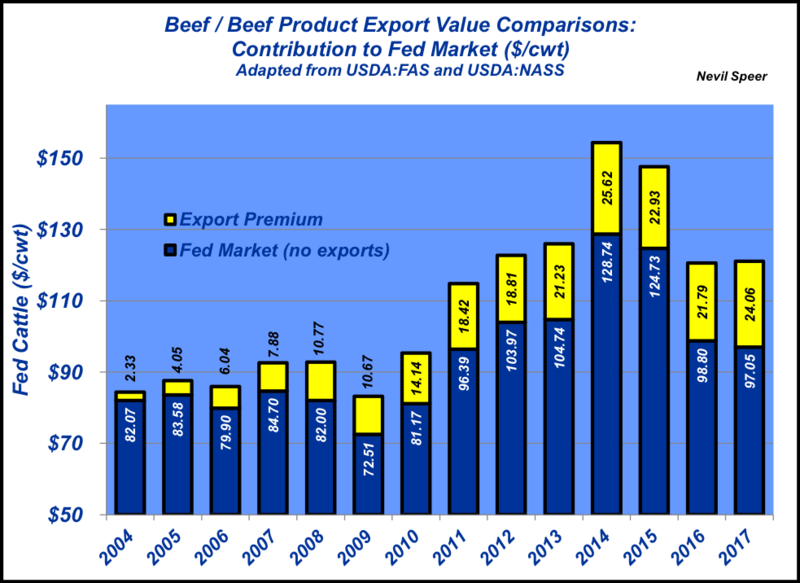 Should the industry commit even more checkoff dollars to help promote U.S. beef in international markets? Leave your thoughts in the comment section below. Nevil Speer is based in Bowling Green, Ky., and serves as vice president of U.S. operations for AgriClear, Inc. – a wholly-owned subsidiary of TMX Group Limited. The views and opinions of the author expressed herein do not necessarily state or reflect those of the TMX Group Limited.